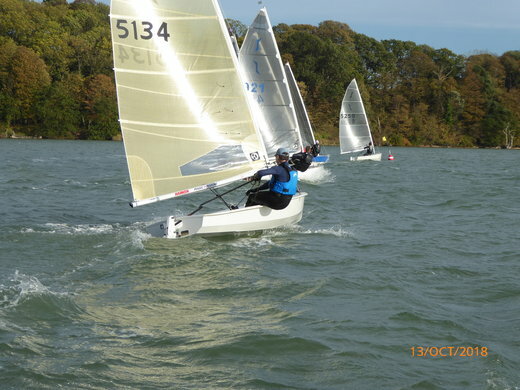 Over the past two or three years Club racing in dinghies has been really successful, and takes place on most Sundays between April and Boxing Day, as well as on most Wednesday evenings during Summer, when wind, tide and light allow. 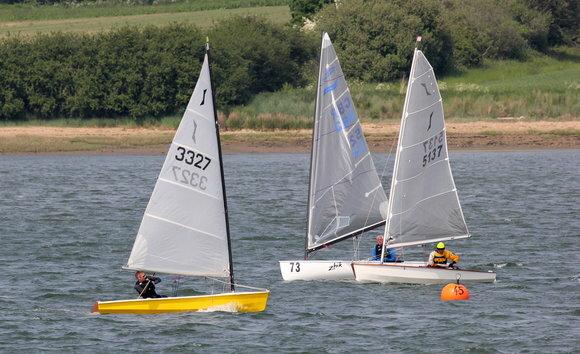 Our Ajax and Laser fleets are flourishing, and seem to need no encouragement, but as we do have a huge fleet of dinghies of all different classes based at our Club, we would love to see many more members joining in our Handicap Fleet racing. Handicap fleet turnouts so far this season have been most encouraging, as the results page confirms. Much help and encouragement is freely available at our Club for all those who up to now (especially any new members) have not yet joined our growing Handicap fleet. Owners of any class of sailing dinghy are eligible, so if your boat does not have a Portsmouth Yardstick number, the Club can devise a suitable PY number for you, if you give us details of your boat. Our handicap fleets comprise experienced helms, together with sailors of all ages and abilities, through to complete beginners – all are welcome, and our very friendly competitors are always willing to provide advice, help and encouragement for anyone who ventures to join us on the water. Notable entries include National 12s, Fireflies, Solos, Larks, Wayfarers (who have their own class Captain) Enterprises, Wanderers, Finns, Phantoms, GP 14s, Toppers, Graduates, Europes and Bytes, all varieties of the ever popular RS classes, especially RS200s and Teras, both of which classes seem to be particularly suited to our conditions, and of course Lasers, using any size sail, are also welcome to join in Handicap racing. Please do consider joining in, starting perhaps by contacting your Class Captain, or indeed any member of our enthusiastic racing fraternity who will be only too willing to pass on their advice. every race, but that is not a problem as they do not need to do so in order to achieve sufficient qualifying points. 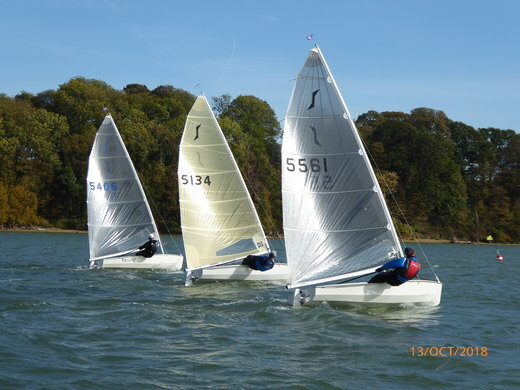 Gordon Sutton is very keen to run basic racing tuition evenings, provided there is sufficient interest, in addition to the our other informal sailing sessions, as listed on the website calendar. Please do let us know if this idea is of interest. As well as the regular races listed in the calendar, there are also some “Fun Races” which are open to everyone – The “Scatter Race” is one example which is simple, and has been very popular. Whilst many Solo helms decided to sit out Storm Callum at home, a lucky 10 Solo helms braved yet another storm forecast to travel to sunny Suffolk. Whilst everyone was checking the various wind apps, delighted with the array of scary colours indicating unsailable conditions, it was actually very sailable. A few helms were smugly snapping photos of the sunny river Orwell to send back home to those that they left in the pouring rain! With a very relaxed 1pm start to accommodate the best of the flooding tide OOD Dr Chris Brown organised both the Laser and Solo fleet initially in a short warm up windward-leeward course to begin the 4 race series. With the windward mark quite tricky to see in the dazzling October sunshine the fleet buzzed the start line in a nice 15 knots-17 knots, and the leeward mark close to the lee shore. The pin end was favoured, and chosen by local h elm Chris Mayhew who popped out and headed uptide inshore, managing enough boat speed to tack and cross the fleet to reach the windward mark first. Second at the windward was Robert Lawrie from Harlow Blackwater SC, closely followed by Jarvis Simpson from Brightlingsea. Down the run Mayhew extended with a direct course to the leeward mark, but closing up was Tim Lewis from Island Barn taking a direct route with Lawrie putting in a later gybe. With helms in short sleeves enjoying a refreshing spray on a beautiful October afternoon the hectic, Mayhew was first, with Lewis launching into second ahead of Laurie and Simpson. Everyone caught their breath, but not long race 2 was off on the same windward-leeward, but this time the windward mark was on the other bank, barely to be seen in the sunshine. The tide still flooding meant the pin was still favourite and Mayhew again escaped left, but after tacking and crossing on port again it was looking good. With the longer beat the fleet spread out and Laurie looked to have gone too far left, but came in with a cracking lift to round first, followed by Mayhew, Simpson and Lewis. With the wind on the increase care was taken for the gybes, especially with the leeward mark near the lee shore. Trevor Whiting from Wroxham and Derek Mayhew from Royal Harwich were having a good battle in sixth and seventh which at one stage looked a little damp as they checked their self-bailers for weed. The wind still fresh saw a continuing fight between Laurie and Mayhew with Mayhew sealing the win from Laurie, Lewis and Simpson. Doug Latta the furthest traveller from HISC/Portchester SC and fresh in his Presidency of the Solo Class was putting in another consistent 5th. In Race 3 the OOD introduced some nice reaches and a triangular course, the high tide allowing the sailors to make the best of the strengthening breeze. The beat a little bit longer, crossing the tide. The fleet all started very closely, but Simpson was seeking an advantage – unfortunately he was over the line, but luckily returned to give himself a handicap. With less tide in this race the beats were more even with lots more tacking on the shifts. The wind was still shifting considerably at the top mark and only the brave arrived on the lay line. Lewis rounded first with a close pack or Laurie, Mayhew and Simpson. The reaches were fast with lots of close racing, the first reach across the tide slightly closer. Two laps again saw lots of place changing with Lewis taking the bullet from Mayhew, Laurie, and an improving Roger Wilson from Rollesby Broad SC in 4th. Race 4 was again a triangle in the most wind of the day. Another close start began and this time with the tide ebbing in places was all to play for. The shifts kept everyone alert and Laurie got away nicely to dominate the final race. The following pack was close throughout enjoying some nice physical reaches with everyone questioning that it was October and they were hot on a breezy day! Wilson put in an impressive result to improve consistently during the day to finish 2nd ahead of Mayhew and Lewis. The fleet returned ashore to enjoy the remainder of the sunshine and a cold beer in the clubhouse. This concluded the 2018 Solo Sea Series and a thoroughly enjoyable day. Next time hopefully without the threat of Storm Callum it might encourage a few more sailors to enjoy the great racing and conditions in this neck of the East Coast – you are all more than welcome – put it in your diary next year!